"I am not like you"
Mizuma Art Gallery is delighted to announce “echowords” a solo exhibition with Korean artist Yoo Seungho. accumulation of tiny Hangeul (Korean) characters. What is the story within the drawings? Yoo employs onomatopoetic words and also words used by children and applies their effects to the artwork. Onomatopoetic words evoke the background and thought relevant to the situation and extend our imagination thereby influencing our view towards the artwork. For instance, he was attracted to the word “Shoooo” which he found in manga. 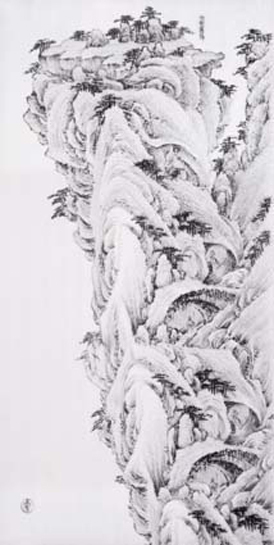 The word is used for the sound of a rocket blast and he created a mountain and water landscape image with those words flowing from top to bottom. 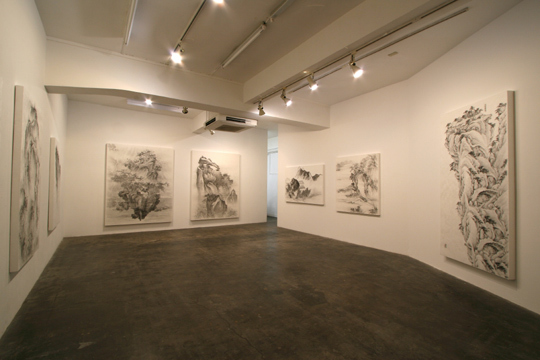 The viewers’ first impression at the work might be “a noble and traditional landscape” but it fluctuates when they find small words and all the elements such as its sound, meaning and layout. The end result is humorous and may give the viewer a giggle. Yoo describes the “sublime and beautiful” mountain and water landscapes as “outdated and boring” and he hopes the viewer can find the humor and irony within his artworks. According to the artist, he attempts to introduce a new perspective to something passed. We hope you enjoy the experience brought by Yooﾕs work with all its hidden humor at “echowords”.